Fabulously feline, isn't it? 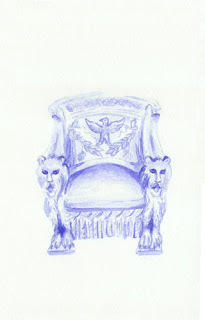 Today is my birthday, so in honor of that, and all the great LEOs out there, here is a magnificent stone lion chair. I can imagine sitting in this chair at the Isabella Stewart Gardener Museum... you know, in that steamy, dreamy courtyard... the one with the Moorish windows that are always packed with flowers spilling out? Yeah, there. This impressive carved marble chair is from Florence, but now resides at the Huntington Botanical Gardens in San Marino, California. It's unusual in the the lion arms are rather aggressive looking. Most chair designers opt for a more docile lion look. While the eagle and olive branch add a touch of formality, the chair balances out that and the mean looking lions with a combination of soft textiles. The seat is intricately carved to resemble a woven brocade, while twisted fringe and lace hang from the edges.